If you venture down to the basement of Jackson Library on the campus of the University of North Carolina at Greensboro, weave your way through the rooms and halls, you'll come across Preservation Services, the people responsible for repairing general collections and the conservation and restoration of items from the special collections and archives. 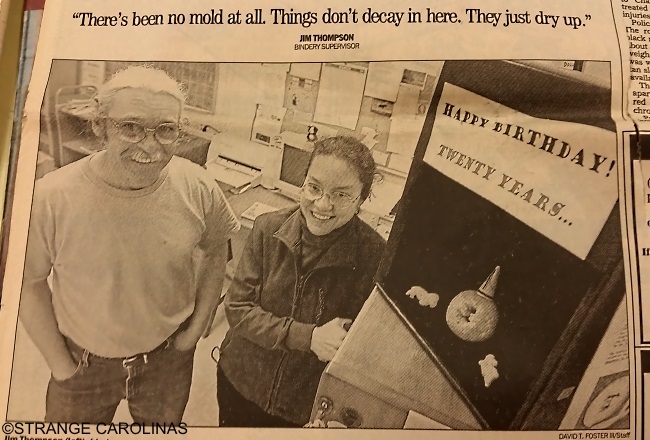 You'll also find a thirty-five-year-old cake doughnut from Dunkin' Donuts. 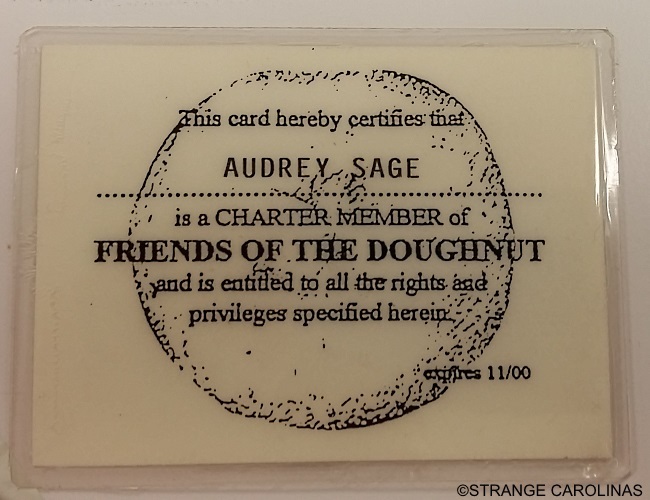 We spoke with Audrey Sage, who has worked alongside the doughnut for the last twenty-four years, about the doughnut's history, its name, and whether it deserves a spot in the Guinness World Records. Tell us about the history of The Doughnut. In 1980, as the story goes, which is before I came here, there were two fellows that worked down here [in Preservation Services]. Being in the basement and desperate for music, they were trying to get the campus radio station to come in on their clock radio. They had strung a bunch of wires up hoping to pick up the signal which was coming from the building next door. Meanwhile, there had been a staff orientation in here. Doughnuts were served and there was one doughnut left on the plate. Being the good housekeepers that they were, it sat around for a while on the plate. At the event, from what I was told, everyone was too embarrassed to be the pig that ate the last doughnut. One day while trying to pick up the radio station, Jack came in and he said, "I bet if I hung that doughnut up there were could get the radio to come in." He hung the doughnut from the wires and the radio station came in clear as a bell. It hung up there and after five years Jack said, "We need to have a party for the doughnut." They had a big party. So every five years, there's a party for the doughnut. There have been doughnut hat contests, poetry contests, best first line of a novel contests, song lyrics. When did it get taken down? I came here when it was eleven. I think when it was ten years old in 1990, Jim had built a velvet-lined box that it sat in because that's what it was in when I came here. 1990 was when it was interviewed and put on Crossin' Carolina with Arlo Lassen, so it was on TV. The 20th anniversary was a big anniversary because it was in the year 2000. It was an election year and one of Jim's friends wanted to put it in the News & Record, wanted to do a story on it because they were tired of covering politics. This was when it got into Ripley's. It got picked up by the AP, it was on NPR, it got put in the Chronicle Of Higher Education, I thought that was funny. 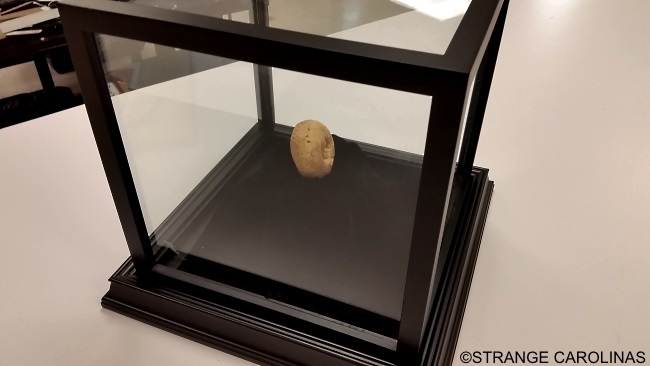 I think when it was 25 or 30, I put it in a better box so it would be a little more protected and look more regal. It does look very regal. Does it have a name? It has been called many names. It's been indeterminate whether it's male or female. There have been theories. Somebody brought in a doughnut that had this extra appendage and said that was its mate. I don't know what happened to that. Maybe it wasn't worthy. People have tried to come up with names, but nothing's ever stuck. It's turning 35 in November. Are there any celebration plans? It's time for another party. We want to make an exhibit so people can become better acquainted with the doughnut. It hasn't been out in public for a while. Maybe a parade around campus? There's been some talk of a parade in the past but I don't think it happened. How many people see it a year? I don't know. Maybe fifty or more. Sometimes a whole orientation group will come through here. I know somebody does a scavenger hunt on campus at the beginning of school and we're sitting, working and people will start filtering in looking for the doughnut. Have you had Guinness World Records in to see it? 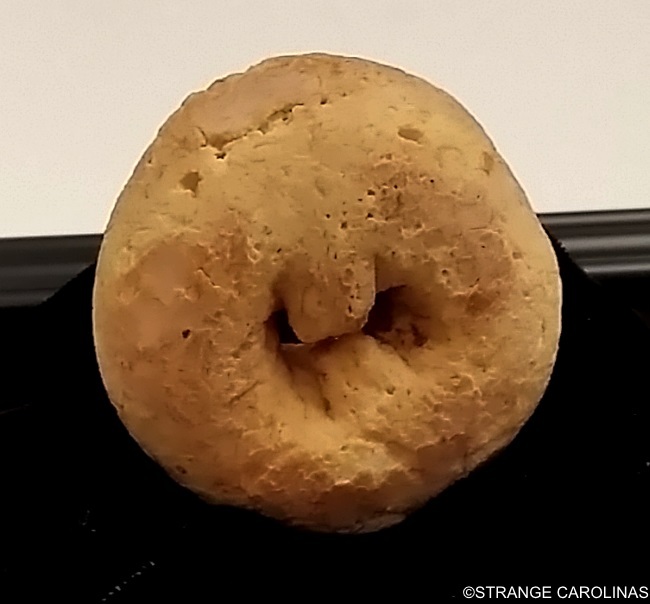 It's not the oldest doughnut. 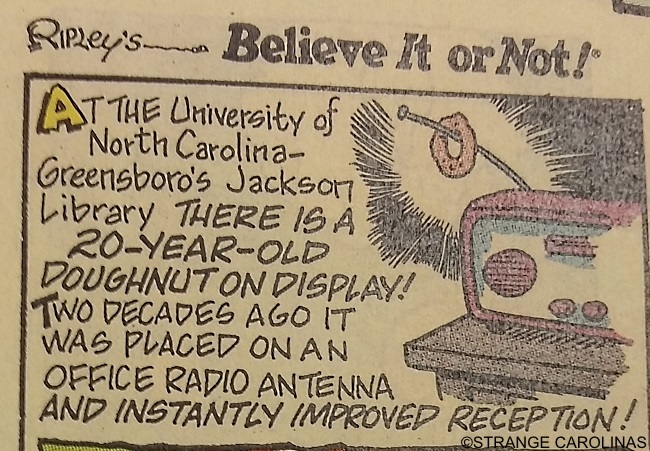 It had a website for awhile and I said it was the "oldest doughnut known to us." But then some man wrote me and said he had a doughnut his grandmother made at the turn of the century. That was the one that was not very nice looking, not as well preserved as this one. We probably wouldn't qualify for Guinness.